With ten illustrations. Reading the Cup is essentially a domestic form of Fortune-telling to be practised at home, and with success by anyone who will take the trouble to master the simple rules laid down in these pages: and it is in the hope that it will provide a basis for much innocent and inexpensive amusement and recreation round the tea-table at home, as well as for a more serious study of an interesting subject, that this little guide-book to the science is confidently offered to the public. 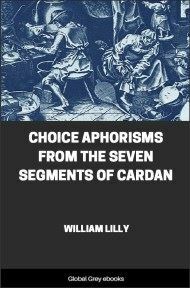 It seems highly probable that at no previous period of the world's history have there been so many persons as there are at the present moment anxious to ascertain in advance, if that be humanly possible, a knowledge of at least 'what a day may bring forth.' The incidence of the greatest of all wars, which has resulted in sparse news of those from whom they are separated, and produces a state of uncertainty as to what the future holds in store for each of the inhabitants of the British Empire, is, of course, responsible for this increase in a perfectly sane and natural curiosity; with its inevitable result, a desire to employ any form of divination in the hope that some light may haply be cast upon the darkness and obscurity of the future. It is unfortunately the case, as records of the police-courts have recently shown, that the creation of this demand for foreknowledge of coming events or for information as to the well-being of distant relatives and friends has resulted in the abundant supply of the want by scores of pretended 'Fortune-tellers' and diviners of the Future; who, trading upon the credulity and anxieties of their unfortunate fellow-countrywomen, seek to make a living at their expense. 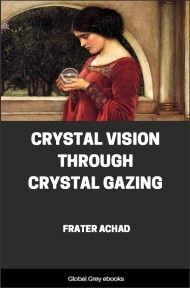 Now it is an axiom, which centuries of experience have shown to be as sound as those of Euclid himself, that the moment the taint of money enters into the business of reading the Future the accuracy and credit of the Fortune told disappears. 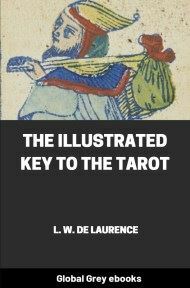 The Fortune-teller no longer possesses the singleness of mind or purpose necessary to a clear reading of the symbols he or she consults. The amount of the fee is the first consideration, and this alone is sufficient to obscure the mental vision and to bias the judgment. This applies to the very highest and most conscientious of Fortune-tellers—persons really adept at foreseeing the future when no taint of monetary reward intervenes. The greater number, however, of so-called Fortune-tellers are but charlatans, with the merest smattering of partly-assimilated knowledge of some form of divination or 'character-reading'; whether by the cards, coins, dice, dominoes, hands, crystal, or in any other pretended way. With these, the taint of the money they hope to receive clouds such mind or intuition as they may possess, and it follows that their judgments and prognostications have precisely the same value as the nostrums of the quack medicine-vendor. They are very different from the Highlander who, coming to the door of his cottage or bothie at dawn, regards steadfastly the signs and omens he notes in the appearance of the sky, the actions of animals, the flight of birds, and so forth, and derives there from a foresight into the coming events of the opening day. They differ also from the 'spae-wife,' who, manipulating the cup from which she has taken her morning draught of tea, looks at the various forms and shapes the leaves and dregs have taken, and deduces thence such simple horary prognostications as the name of the person from whom 'postie' will presently bring up the glen a letter or a parcel or a remittance of money; or as to whether she is likely to go a journey, or to hear news from across the sea, or to obtain a good price for the hose she has knitted or for the chickens or eggs she is sending to the store-keeper. Here the taint of a money-payment is altogether absent; and no Highland 'spae-wife' or seer would dream of taking a fee for looking into the future on behalf of another person. It follows, therefore, that provided he or she is equipped with the requisite knowledge and some skill and intuition, the persons most fitted to tell correctly their own fortune are themselves; because they cannot pay themselves for their own prognostications, and the absence of a monetary taint consequently leaves the judgment unbiased. 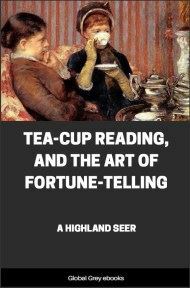 Undoubtedly one of the simplest, most inexpensive and, as the experience of nearly three centuries has proved, most reliable forms of divination within its own proper limits, is that of reading fortunes in tea-cups. Although it cannot be of the greatest antiquity, seeing that tea was not introduced into Britain until the middle of the seventeenth century, and for many years thereafter was too rare and costly to be used by the great bulk of the population, the practice of reading the tea-leaves doubtless descends from the somewhat similar form of divination known to the Greeks as "κοταβος" by which fortune in love was discovered by the particular splash made by wine thrown out of a cup into a metal basin. A few spae-wives still practise this method by throwing out the tea-leaves into the saucer, but the reading of the symbols as they are originally formed in the cup is undoubtedly the better method. 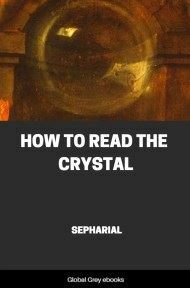 Any person after a study of this book and by carefully following the principles here laid down may with practice quickly learn to read the horary fortunes that the tea-leaves foretell. It should be distinctly understood, however, that tea-cup fortunes are only horary, or dealing with the events of the hour or the succeeding twenty-four hours at furthest. The immediately forthcoming events are those which cast their shadows, so to speak, within the circle of the cup. In this way the tea-leaves may be consulted once a day, and many of the minor happenings of life foreseen with considerable accuracy, according to the skill in discerning the symbols and the intuition required to interpret them which may be possessed by the seer. Adepts like the Highland peasant-women can and do foretell events that subsequently occur, and that with remarkable accuracy. Practice and the acquirement of a knowledge of the signification of the various symbols is all that is necessary in order to become proficient and to tell one's fortune and that of one's friends with skill and judgment.